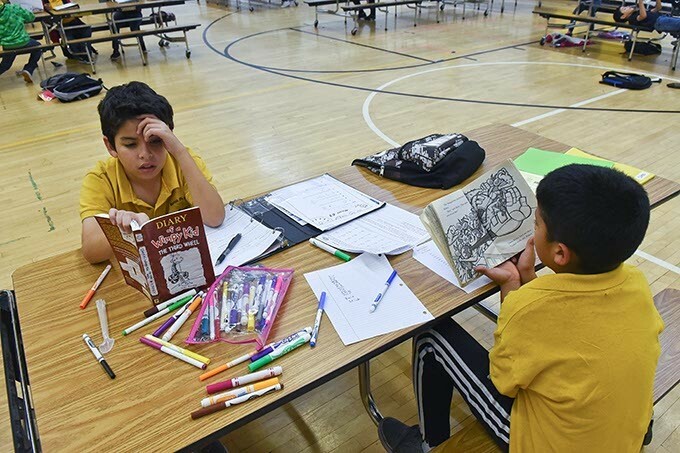 Two boys at Santa Fe South elementary, an OKC Charter School, read books during a Boys and Girls Club After school program, 11-9-15. Oklahoma City parent Ryan Marshall gets it. For the Marshalls, the best education for their children was at Cleveland Elementary. The kindergarten through fifth grade school offers a specialty fine arts and science program. 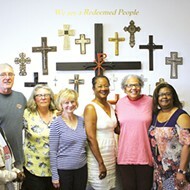 About six years ago, the family moved from Edmond to the Cleveland neighborhood, located in the northwest quadrant of OKC. 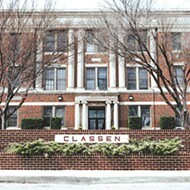 A year after the move, Oklahoma City Public Schools (OKCPS) backed away from the magnet school approach offered at the campus. It upset Cleveland parents, like the Marshalls, but the community agreed to work with the district to continue the schools emphasis on the arts. With community support, the school maintained an arts enrichment program and provided a unique approach to its science curriculum. Marshall appreciates parents working with school leaders to create education opportunities. He hopes the collaboration continues as the district launches a public conversation about the future of its schools and predominantly features talks of charter school expansion. Marshall, among others present at the Feb. 22 OKCPS school board meeting, wants the conversation to include curriculum, unique opportunities, partnerships and other aspects to strengthen education for all district students. The states largest school district is entering a critical time for parent and community involvement. The district with ties to 12 OKC charter schools is considering expanding the charter sector to serve students in neighborhood schools. 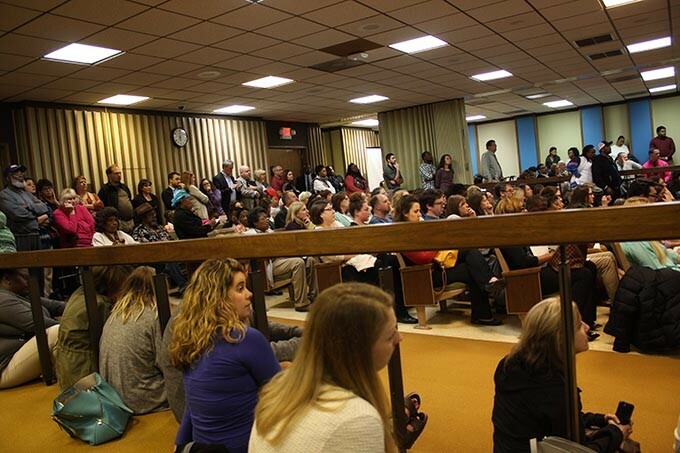 Its a conversation that parents of children in charter schools saw coming, but it blindsided many public school parents who crowded into the districts February board meeting. Charters are publicly funded and independently operated schools that opened across the state following changes in state law around the millennium. Often viewed as private schools with state funds, charters offer parents an alternative to public schools and give teachers more freedom in their classrooms. Despite state accreditation for academics, charters are free from some regulations that are mandatory in public schools. The value and role of charter schools is debated across the nation. 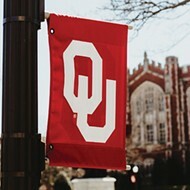 However, Oklahoma is home to a number of nationally recognized charters, including KIPP (Knowledge Is Power Program) Reach College Preparatory in northeast Oklahoma City. In 2012, it received one of the highest honors a school can achieve from the U.S. Department of Education when it was named a National Blue Ribbon School. 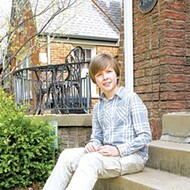 Last fall, fellow charter Harding Fine Arts Academy received the same honor. Last month, KIPP leaders joined representatives of Santa Fe South Schools and John Rex Charter Elementary School and approached the Oklahoma City Public Schools Board of Education about a concept called Quality Seats Program. The three charter schools want to expand their models into the district. All three charters are limited on the number of students they serve. Currently, John Rex operates as an elementary school downtown, but parents hope it expands into a middle and high school. 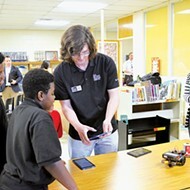 KIPP serves middle-school-aged students but would like to offer an elementary component to more northeast OKC families. 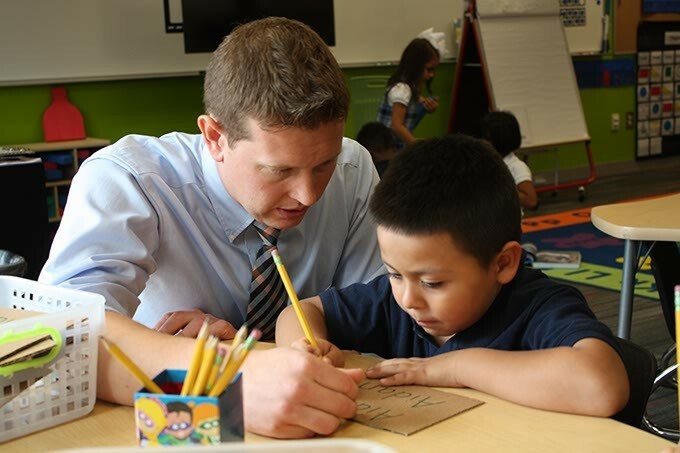 Located in the citys south side, Santa Fe South serves 2,100 students in prekindergarten through 12th grades and desires to ease overcrowding of the districts southside schools. Rob Neu, OKCPS superintendent, described the Quality Seats program as starting an important conversation. Charter interest comes as the district feels the effects of a state revenue failure. OKCPS estimates a loss of $30 million in state aid and other state funds for fiscal year 2016-17. With less revenue, Neu expects classroom sizes to grow and district leaders to cut services, including possible school site consolidation. The eight board of education members will review a resolution to authorize further conversation and study charter school expansion during the March 21 meeting. If approved, the public can expect opportunities to participate in community meetings conducted by local nonprofit Possibilities Inc. and funded by the Inasmuch Foundation, a local organization that supports education, health and human services and community enhancement initiatives. Inasmuch is tied to all three charter schools and the district because it grants funds to KIPP, Santa Fe South and OKCPS. 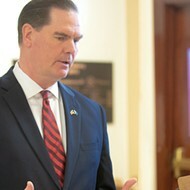 Additionally, foundation president and CEO Bob Ross is a member of the John Rex board of directors and the Oklahoma State Board of Education. Any charter school expansion pitch would come before the school board in May or June. Each charter submits separate expansion plans, which the board could approve or deny. If denied, a charter could still continue expansion plans but wouldnt do so through a direct partnership with OKCPS. District approval is not needed for the schools to grow their programs. The three charter leaders expressed interest after watching new education initiatives placed in OKCPS over the past two years. Neu joined the district in 2014. The topic of charters often is greeted with mixed emotions. If the districts board decides to move forward with the Quality Seats program, the public can expect intense debate about charters and reshaping the district. The charter school concept is to create an improved learning environment for traditionally underserved populations. Through increased resources from outside companies, tailored curriculum and state funds, charters strive to close achievement gaps. Across the country, education leaders and policy experts have closely studied and monitored how charters impact students and families. Some studies support charters that live up to their founding concept. 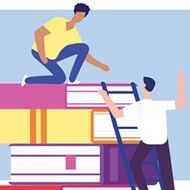 In studies conducted in 2009 and 2013, the Center for Research on Education Outcomes, a widely cited group studying charters, found the schools positively impacted students in poverty and increased reading and math scores for English language learners. Other studies have found little difference between charters and public schools. Critics of charter schools question their ability to work with students with behavior problems and those with moderate to severe needs. Traditionally, charters have strict conduct policies. When a student is found in violation, they are asked to leave the school permanently. Another concern is application processes or lottery systems used for enrollment. Neu addressed such concerns to the public during the February meeting. Voting on charter expansion is for the board, but as district leader, he will make a recommendation. There are 32 accredited charter schools and 45 charter school sites in Oklahoma, according to Oklahoma State Department of Education data. By law, charters must maintain state accreditation. Additionally, sponsors and governing boards hold them accountable. Charters that fail to maintain accreditation are reviewed by the Oklahoma State Board of Education, which revoked the accreditation of Alexis Rainbow Arts Academy in July. The OKC charter was sponsored by Langston University and failed to meet state academic, financial and safety requirements. Parents and school leaders agree the district is embarking on an important community dialogue with much at stake. Decisions could influence schools for generations. Marshall hopes the district rises to meet expectations and keeps the community involved. He wants parents, teachers, administrators and community leaders participating in community meetings at multiple locations. 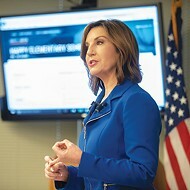 Visit the districts website, www.okcps.org, to find a direct link to proposed charter school expansion information and sign up for updates from Possibilities Inc.
Print headline: Greatest conversation, OKCPS wants community feedback on charter school expansion, and talks could include the future of education.